Peugeot take another step and enters the hatchback segment with unveil of Peugeot 308 GTi 2016. At the Frankfurt Motor Show 2015, company remarked its proficiency in creating hatch by sharing this model. Equipped with better interior and engine the hot hatchback is all set to roll down the streets. 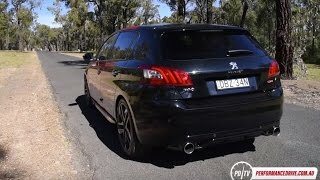 Let us have a look at the review of Peugeot 308 GTi 2016 to know more about it. 0-62 mph: 6.2 seconds and 6.0 seconds. The interior of Peugeot 308 GTi 2016 carries with it everything that you can expect from the hatchbacks of today’s automotive generation. The black upholstered seats feature red stitching to add the contrast accompanied by the same stitching essence throughout the cabin while the door sills, pedals and gear knob are made from the Aluminum. For sitting buyers will get the bucket seats upholstered in black and grey Alcantara. The steering wheel gets a bit smaller shape and comes wrapped in full-grain leather. Behind the steering wheel is the central digital instrument cluster amidst the two analogue gauges. 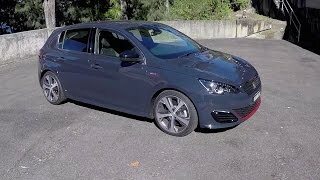 In all rounding up the interior details of Peugeot 308 GTi 2016 I would say it is sportive, tech oriented and comfortable. 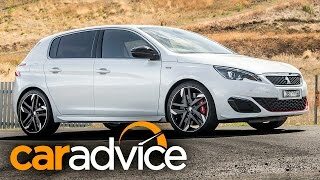 The exterior of Peugeot 308 GTi 2016 compliments the interior; it is adorned with clean and simple lines that make it a decent ride through the city. The front fascia of the model is adorned with double grilles lined chrome which further get enhanced with the horizontal glossy black check patterned finishing. Along the sides of the grille are LED headlights while the bumper has two subtle spoiler winglets. The winglets according to company are a ‘boost to aerodynamic performance’ but how far the concept is true can be judged only after riding the model or after having a look at the performance figures. Moving towards the rear end you’ll notice redesigned skirts while reaching the rear the model has a gloss-black lower diffuser with twin exhaust tips that spread the aggression. 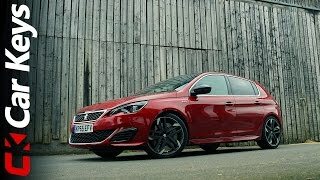 In all rounding up the exterior details of Peugeot 308 GTi 2016 I would say, it is worth the era. Beneath the hood of Peugeot 308 GTi 2016 are two powertrain options coming through the 1.6 liter THP S&S engine. The engine cranks total output of 250 hp and 270 hp while the peak torque remains same for both the variants which is 330 nm. 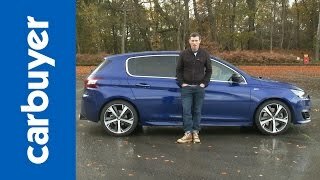 The top speed of Peugeot 308 GTi 2016 is electronically limited at 155 mph while the 0-62 mph sprint can be knocked in 6.2 seconds and 6.0 seconds respectively.